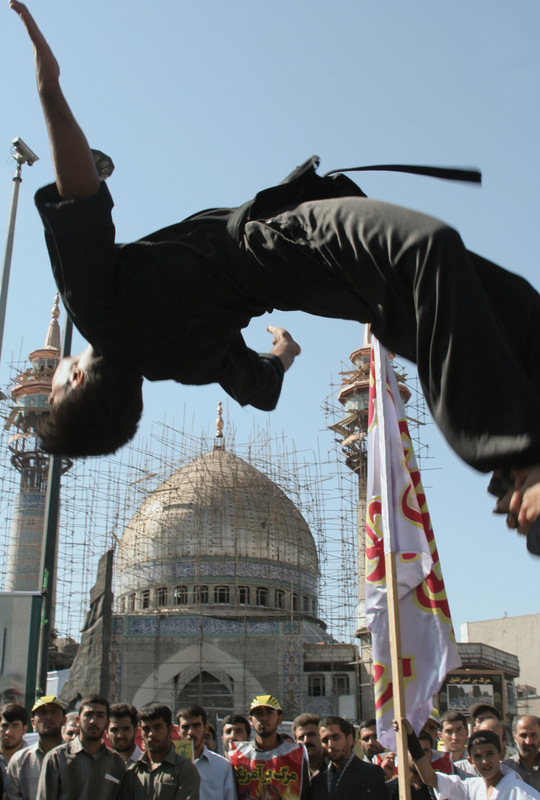 Acrobatic extravagance in Tehran, as seen by Iranian photographer Kian Amani. I was born in Tehran in 1980 and have for 10 years been working as a journalist and photographer for the Iranian press, including Entekhab, Etemad, and Hamshahri. I am also a photo editor of Cultural Heritage News, a documentary film-maker and the editor of the Iranian Artist Forum. This photo was taken in Tehran on Quds Day, 12 October 2007, and shows a demonstrator undertaking an incredible aerobic performance to draw the attention of the crowds. Quds Day is an annual event which takes place on the last Friday of Ramadan and is open to Muslims and non-Muslims alike. Al-Quds is the Arabic word for Jerusalem; the day was declared in 1979 by Iran’s supreme leader, the Ayatollah Khomeini, as a day of unity amongst Muslims from all over the world, following the outbreak of war between Israel and Lebanon. Now, Muslims around the globe, from Beirut to Berlin, Jakarta to Toronto, take part each year in this anti-US and anti-Israel demonstration, burning flags, chanting slogans and drawing attention to the fate of oppressed Muslims across the world, particularly in Palestine. Iranian TV and public radio encourage participation by involving famous actors and actresses to draw the crowds, and by transmitting programmes which increase the public’s excitement.